The hotel has 130 rooms. Ibis Styles Budapest Center is situated in the business and shopping centre of Budapest, with easy access to cultural and tourist attractions and direct underground connections. 10 minutes walking distance to the major shopping area. Airport: 20 km km >> Order your transfer! 130 sound-proof rooms fitted to the newest IBIS standards with air-conditioning, bathroom, colour TV with satellite channels, phone, modem connection, minibar. Rooms for non-smoking and disabled visitors. Mercure buffet breakfast at your service. Lobby Bar is providing a range of drinks and snacks. The restaurant is available for seating 100 people, offers Hungarian and International specialities. Garage, gift-shop, currency exchange, Business Center with Internet access. 4 fully equipped seminar rooms. By plane: 20 kms from Ferihegy Airport. Aiport Minibus Service is available. 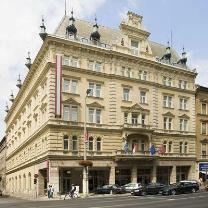 By train: From the South and the East Railway Stations by underground M2 to Blaha Lujza tér. From the West Railway Station by tram No. 4 or 6 to Blaha Lujza tér. By car: From Vienna on Ml highway crossing Erzsébet bridge to Blaha Lujza tér. By public transport: A few minutes walk from Blaha Lujza tér, which can be reached by tram No. 4 or 6, bus No. 7 or 7A or by direct underground connection M2.